"Gran Turismo", the PlayStation® premier racing game, has released its first official App. 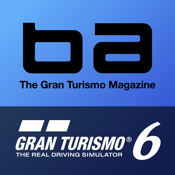 This App contains the "Beyond The Apex" booklet that was only available in the limited release edition of Gran Turismo 6 sold in Japan and Asia, coupled together with a newly added dynamic vehicle database. The app contains not only game play information but also detailed description of the mechanism behind automobiles and lots of other car related information, making it a must have for any car enthusiast. Contains the digital version of "Beyond The Apex", the booklet that was included in the limited edition release version of Gran Turismo 6. The basics of automotive engineering, mechanism, tuning and settings are introduced with rich visual imagery. Towards the end is a course reference guide for Gran Turismo 6 that also serves as a tour guide of the world. The over 1200 cars included in "Gran Turismo 6" has been organized in a database encyclopedia of cars. Descriptions and detailed specs of the cars can be viewed together with beautiful images of the cars in a list, and can be searched or sorted by name, year model, and other specs. - Contains the digital version of "Beyond The Apex", the booklet contained in the limited initial release edition of "Gran Turismo 6". - Database of the vehicles included in "Gran Turismo 6". - The content of the app is accurate as of December 2013, and any data about additional content introduced with subsequent updates is not included. - The power weight ratio is a figure which divides vehicle weight with maximum output. - This app is available in US English, UK English, French, German, Italian, Spanish, Brazilian Portuguese, Mexican Spanish, Japanese, Chinese, Korean and are available through their respective App Store.